Five months in a row, the automobile industry again hits a rough patch in the month of March. The passenger cars sales experienced a dip of 23 per cent in the same month of the last fiscal year. As a result, fiscal year 2013 has been recorded as the worst year in the Indian automobile history after FY 2001 when car sales fell by 7.7 per cent. Moreover, the numbers from industrial body SIAM (Society of Indian Automobile Industry) data reveals that passenger cars has shown de-growth of -6.69 per cent and marginal growth of 1.08 per cent in Van segment. Even the attractive discounts and innovative price schemes from many of the auto manufacturers has not been encouraging enough to drive the sales number. As per industry experts, the factors responsible for the slowdown in automobile industry are rising interest rates, negative sentiment in the marketplace due to inflation and fuel price. "Customers are trying to push their buying decision for some time due to current economic conditions" says Abdul Majeed, National Automotive leader, PWC. The only positive segment of the automobile industry story are the utility vehicles; the segment has shown a remarkable growth of 52.20 per cent and sold 5.53 lakh units which gives hope to auto-manufacturers that in coming months industry performance will bounce back. In the segment, the market leader Mahindra & Mahindra has registered a growth in sales by 27 per cent and the French automaker who has just stepped in the Indian automotive market has sold more than 40,000 units of Duster than the expected projection since its launch. "Indian automotive market is dominated by the small car. So the volume base of the utility vehicle is small, so any growth happening in that segment will overshadow the mass segment. On other hand, Young entrepreneurs, self-employed and business men are shifting from conventional segment (hatch back and sedan) to utility vehicle so that can use their vehicle for work and as well as for leisure" adds Abdul Majeed. As the compact utility vehicle fall in the same price bracket of premium hatchback and entry level sedan consumer are shifting to compact utility vehicles. After a struggling year, the industrial body SIAM is optimistic about the next fiscal year and expects a revival. It is projected that the passenger vehicle will grow up to five to seven per cent in summation of segments like passenger cars (three to five per cent), utility vehicle (11-13 per cent) and vans (four to six per cent). 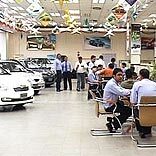 The projection is based on the assumption that macro-economic condition will improve like decline in cost of ownership as the petrol price will fall five to seven per cent and interest rates will come down to 25-30 bps and growth in utility vehicle will continue as new launches are expected in the next fiscal. The upcoming launches in the segment are Chevrolet Enjoy, Ford Ecosport, Maruti XA-Alpha and Toyota Rush. The market leader in the segment is planning to launch a premium sedan Vibe based on Verito platform to taken on the competiton with best sellers Maruti Swift & Hyundai i20.